We pack a large wicker basket with only the finest fresh seasonal fruits and gourmet specialties for a truly royal treat. Hand-delivery ensures this basket will arrive at its peak of flavor. Fruit may include crisp apples, bananas, sweet oranges, juicy pears, plump grapes, nectarines, pineapple, kiwi and more as available. The gourmet items may include cookies, crackers, cheeses, and chocolates. 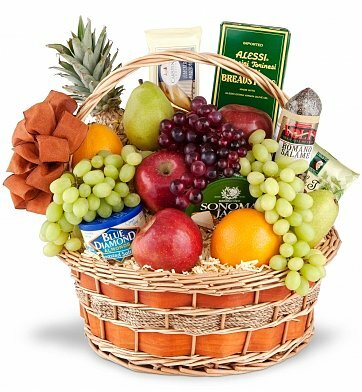 Exact basket and fruit/gourmet selection may vary by season and delivery location. Royal Fruit and Gourmet Basket is a hand delivered gift. These gifts are delivered by one of our local design centers located throughout the United States and Canada. Same day delivery is available for most gifts when ordered before the cutoff time. The cutoff time for Royal Fruit and Gourmet Basket is 9 AM in the recipient's time zone. Hi, My son loved the WHOLE basket he was very pleased with what you had put together in this basket. I most likely will be ordering again in the future for something . Thanks for making my son happy getting a variety of fruit. Just the right size and a beautiful gift for all. Our department ordered this for our Department Head after he had surgery. He relayed back to us that the basket was beautiful and had all the fruit he loved. We were very pleased the product was of such great quality! We will definitely use this site again! We sent this as a wedding anniversary gift to some very dear clients celebrating their 45th. His thank you note began with "Holy moly! This thing is huge!!" Needless to say, it relayed the message of cheer and appreciation that we wanted to send. Thank you! They were delivered on time. It was excellent gift basket! Thank you! This is a great basket, love the variety!!!!! Brought a tear to the recipient's eye!! The delivery man offered to bring the basket into the home for the customer as the basket was so heavy, he didn't want the rather fragile client to hurt herself. It was beautiful and all the fruit was very fresh. Excellent gift and service. Thank you Gift Tree, very well done. Basket was beautiful. Received a lot of wonderful feedback for the receiver and also guest. I ordered online via Australia and the basket was shipped on time to NYC. The card was perfectly written and the recipient was so over joyed they tore into the basket immediately. I was kept up to date on the shipping and am so happy with this gift and the ease of the entire process. I will return and order again. Thank you so much!! Both baskets were beautiful and greatly appreciated, and tasted great. Was truley beautiful and good. My son and his wife called me as soon as they got it. They said that it was great, and they enjoyed it very much. The basket was big and they ate half of it the day they got it. I will never order from anyone else. Thank you. We sent this gift to my in-laws for their combined birthdays. Since they are the type of people who have everything, we thought this was a great choice. They are in Florida with family and friends and thought this would be something they could share. They loved it! Recipient was ecstatic! Much larger than anticipated. Delivery was as promised. Will definetly be using again. VERY happy! This basket was sent to a sick military man; the presentation and fresh fruit was awesome. Going foward I will order all of my friut/gift baskets from here. Thank you so much for your excellent services. My son's coaches were wonderfully blessed with the basket.